BOSTON — A new simulator is letting scientists use a joystick to swim a virtual whale across a video screen. But this is no game — it's a serious attempt to better understand how the giant mammals become entangled in fishing lines. Tim Werner, a senior scientist at the New England Aquarium's Anderson Cabot Center for Ocean Life, hopes the technology will lead to safer fishing gear designs and help critically endangered North Atlantic right whales avoid the looming threat of extinction. "If we can see how they get entangled, it would help us prevent it. The technology in computers has evolved to a state where we can model these things," he said. More than eight in 10 critically endangered right whales become ensnared by fishing lines, and nearly six in 10 are entangled more than once. 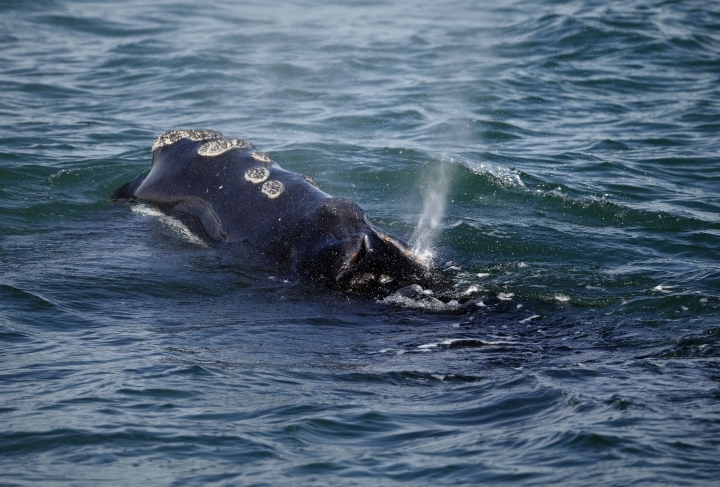 Entanglements are a leading cause of right whale deaths. Experts estimate there are no more than 440 animals left on the planet, and the species' future is bleak because of heavy mortality and poor reproduction in recent years. Werner says the video simulation has helped his team better understand how whales unwittingly — and often lethally — wrap themselves in the fishing buoy lines that hang vertically in the ocean. Marine biologists say entangled whales often can't feed, and the stress weakens them and makes females less likely to birth calves. This past season, not a single new birth was discovered. Aquarium scientists, working with researchers at Duke University, published their findings this week in the journal Marine Mammal Science, describing how they're using a standard video game console to "swim" a computer-generated whale through heavily fished waters to recreate an entanglement. The simulator shows how a whale might flinch as it strikes a rope, then instinctively corkscrew and roll — ending up with the line hopelessly wrapped around its body and flippers. It also lets researchers reverse the simulated entanglement. Vikki Spruill, the aquarium's president and CEO, says the technology is the latest effort to work with fishermen and engineers to solve the entanglement threat. Scientists working with a grant from the National Oceanic Atmospheric Administration already are testing ropeless gear with lobstermen in the Gulf of Maine. "It's our mission to find conservation measures that make a difference," Spruill said Wednesday in a statement. Werner said the simulator accomplishes what scientists can't do in real life: test fishing gear on actual whales. "There aren't enough of them, and we wouldn't purposely see them get entangled," he said. Plus, it would take decades — time the species doesn't have — to collect enough data. Researchers say they eventually may use the simulator to model and study threats to other ocean creatures such as leatherback sea turtles.